With seasonal elements such as powerful blizzards and record-breaking snowfalls, ice melt should be applied to key walkways around facilities as part of a complete snow removal plan. According to a report released by the Toronto Public Health Department, from 2006 to 2015, 30,000 people in Toronto went to an emergency room as a result of a slip-and-fall accident due to ice and snow on walkways, and 10 per cent were hospitalized due to these injuries, with 2,300 claims filed against the city. Managers, as well as facility maintenance staff, can help minimize the number of accidents by having both a snow removal and ice melt application program in place. Snow removal should begin once snow accumulations are one inch or more. This is important because it can help reduce the amount of ice melt used, keeping costs down and minimizing any detrimental impact that ice melt can have on vegetation and the environment. The cleared snow should be moved to areas that are not adjacent to walkways or parking areas to prevent the flow of water if melting begins. Once temperatures dip below 0 degree Celsius, the melted water may re-freeze, creating new areas that are potentially dangerous. In many Canadian cities, snow build-up on walkways must be cleared within 12 hours after snow ends. However, once shoveling begins, the snow cannot be shoveled into a street or roadway. In Toronto and other Canadian communities this is illegal. There may also be restrictions as to dumping snow in nearby waterways. Once the snow has been removed, the application of ice melt can begin. Many ice melt products are made using calcium chloride. As this ingredient absorbs moisture, it releases heat, which helps melt the ice and slow the build-up of ice on the walkway. Calcium chloride also works relatively fast and may have a reduced impact on nearby vegetation. 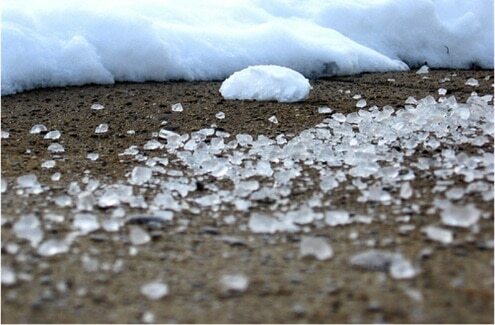 Be wary of ice melt products that indicate they are safe for vegetation or will not track on to building floors. Most ice melt products have the potential to harm nearby vegetation (especially if too much has been applied) and can harm indoor floors once accumulated on the bottoms of shoes. North facing walkways tend to ice up more than other areas; these areas may need more ice melt and more frequent ice melt applications than other areas. 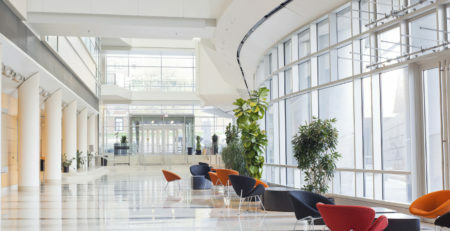 To minimize cost, protect the environment and your facility. Do not blanket all walkway areas just because north facing walkways have become icy. 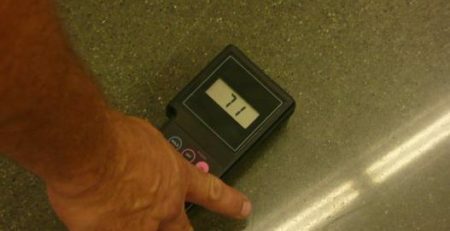 Related to this, managers and custodial workers should develop an ice watch program, which refers to ongoing monitoring and documenting of ice conditions around the facility. 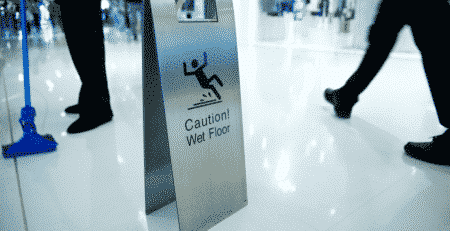 Documenting may be necessary for verification purposes in case a slip-and-fall accident occurs and will also help managers/custodial workers become aware of ice development patterns, such as which areas become icy first or need the most attention. Managers should ensure that workers applying ice melt are trained on how to use the product and are aware of flow settings on ice melt applicators, application speed, types of equipment to use, how to apply the ice melt, which type of ice melt works best on different surfaces and at different temperatures, etc. Depending on the amounts used, most ice melt products have the potential to remove a floor’s finish. Selecting the right type of cleaning solution is imperative, he adds, as not all cleaning solutions are of the same caliber. For daily care, a high quality floor cleaner with a neutral pH, in the 6.8 to 7.8 range, is a good option. An effective neutral cleaner will help remove soils and ice melt residue, while protecting the floor’s finish. The product should also be flexible, so it can be used when mopping the floor or for use with an automatic scrubber. When salt and calcium deposits have built up on floors, select a product that neutralizes those deposits and helps suspend soil and salt residues so they can be easily removed. This usually calls for a product designed specifically to remove the haze of the ice melt product. “This saves a step because it allows the same product to be used to clean the floor [and] some of these products can also be used to keep industrial carpets clean and prevent damage to carpet fibers,” Watt emphasizes. 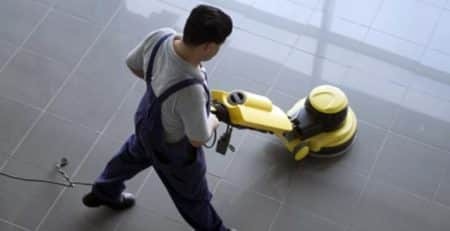 Thoroughly sweep or vacuum all floor areas to be cleaned. Dry mop the area with a microfiber flat mop to remove any remaining ice melt crystals. With some products, but not all, the floor may need to be rinsed with clean water. 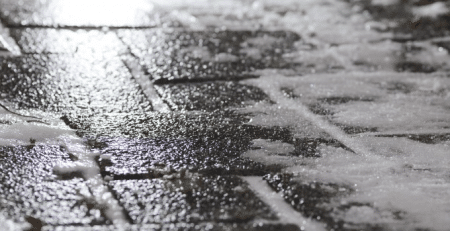 Ice melt plays a key role in preventing winter accidents and injuries, but it must be applied carefully and properly removed from indoor hard-surface floors.